The relatively peaceful state of Kerala is grappling with a situation that it has never before encountered. 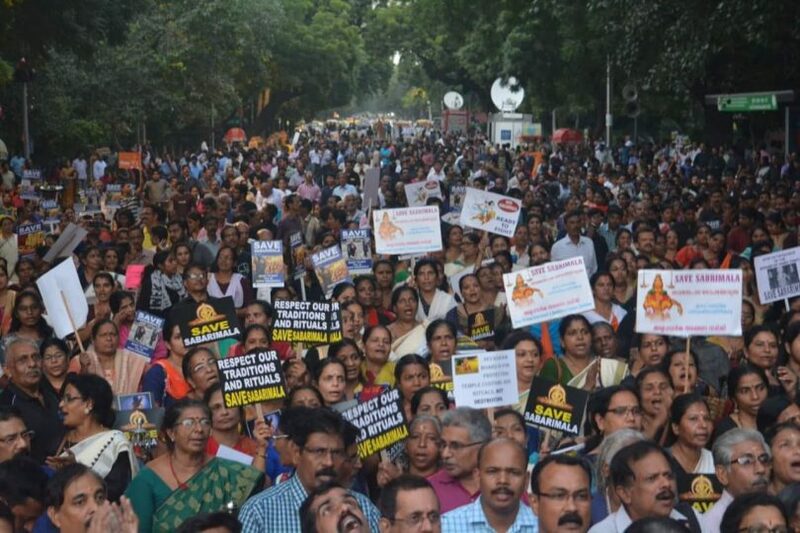 The Supreme Court verdict allowing the entry of women belonging to all age groups to the Sabarimala temple is threatening to divide a society that stood united just two months ago when the state was hit by the devastating floods. The debates and deliberations surrounding the consequences of this verdict will reverberate through the nation for a long time to come. But at a time like this when the secular fabric of a society remains threatened, it becomes important to go deeper to understand the sinister ploy of the Left government. The sight of an activist Rehana Fathima along with a journalist Kavitha Jakkala being escorted by the state police forces to Sabarimala is a telling sign of how the Pinarayi Vijayan-led Left government is using the verdict to spread religious discord in the state. How else can one explain the excessive interest taken by a state’s chief minister in ensuring the safety two women who in all probability are not even believers? Here in addition to disrespecting the SC verdict which gave all believers the right to visit the temple, Vijayan is also mocking the sentiments of people who elected him to power. The fact that religion is a deeply personal matter and falls within the purview of a person’s conscience was not even given scant regard by a chief minister who has the duty to protect the interests of citizens. It needs to be noted here that the systematic attack on the state’s Hindu religious institutions dates back to the time of CPM leader E.M.S.Namboodiripad who staunchly believed Karl Marx’s teaching of “religion being the opium of masses” and encouraged people to embrace atheism. In subsequent years, the same opium became the last ray of hope for a party that is facing an existential crisis. Unable to understand the developmental needs of the changing times, religion became a tool for them to keep the society in a permanent state of unrest. Intimidation became the weapon of choice for the party and human dignity remained a concept confined to the left liberal textbooks. It will not be wrong to argue that the Sabarimala verdict is a culmination of the divisive politics pursued by the Left parties over a period of time. The first affidavit which the apex court relied on significantly for its final judgement was filed by the then Devaswom Minister G Sudhakaran during LDF government’s period in 2006-11. It is interesting to note here that this was done at the behest of none other than the then state secretary Pinarayi Vijayan. This was immediately followed by a notification that specified age limits for women to enter the shrine as against the prevailing practice of menstruating women not being allowed inside Sabarimala. What nobody realized at that point was the start of a well thought out narrative that suddenly made women unequal and men privileged. The practice of exclusion was soon turned into a practice of discrimination that attracted widespread contempt from sections who unwittingly played into the hands of the Left parties. The Congress government which came to power afterwards stood firm on respecting faith and traditions and refused to pursue the affidavit that was filed. But in the next election when the Left government was once again elected to power, a fresh affidavit was filed. The fact that rules of the temple were decided according to Bhoothanatha upakhyana and the fact that the deity is a naisthika brahmachari or one who has vowed eternal celibacy were conveniently forgotten. Contrary to popular belief, it was not the ‘impurity’ of menstruation but the reverence to the celibate form of the deity due to which women willingly kept away from the shrine. Added to this is the scientific and logical reason of the conflicting energies produced by the magnetic field of that particular place interfering with the reproductive cycle of women. Despite strong backing of religious scriptures and scientific studies, the Left government left no stone unturned to keep the lies afloat and went on attacking the foundation of Hindu traditions and beliefs. Under the watch and guidance of the CPM government, interpretations were concocted which went beyond reason. In the affidavit filed, it was claimed that Sabarimala shrine was once a Bhuddist shrine. When asked how did the temple then come to be known as ‘Matanga mala’ which precedes Buddhism, the so called historians did not have an answer. Also, a temple which stood for Kerala’s secular heritage was used as a tool to spread communal hatred across the country. After the Pinarayi-led government came to power, the attack waged was not just ideological but a concerted effort was made to usurp Hindu religious institutions to change the very character of the Hindu religion. The dissenting voices within the party were brutally suppressed by the chief minister. When the Devaswom Board President and party member A Padmakumar mentioned the filing of a review petition, he was reprimanded by the chief minister and asked to stay mum on the issue. A party that does not even respect the right to individual opinion is carrying forward with the illusion that they have the responsibility of being torch bearers of change. If anything, they are just harbingers of tyranny in a society that was equal in all measures. The shrine of Sabarimala represents the highest form of spiritual enlightenment that is inward looking and goes beyond gender, caste, class and creed. This is not a concept that the Left government which can go to any length to achieve their vested political interests will ever understand. Their hidden agenda came to light when massive public rallies were held to celebrate Janmashtami, the Hindu festival and there were attempts to read Thunjath Ezhuthachan’s Ramayana, the literal and spiritual value of which was deliberately misappropriated by the CPM years ago. It is clear that the Left wants to attack the age-old beliefs and traditions of the Kerala society for ensuring its relevance in the present times. Unable to make any mark on the development front and with people’s supporting eroding, the Left in Kerala has taken recourse to people’s emotions to win vote banks. It is a dangerous trend that has the potential to change the dynamics of the state. Here, a recollection of chief minister Pinarayi Vijayan’s response to a cross being demolished in Munnar as part of an eviction drive in 2017 would be of great interest. Slamming the Iddukki District administration, he said it is a direct attack on people’s belief system. Why then, one wonders does he have shifting standards in the case of Sabarimala. Have we reached a stage where faith is also being quantified and qualified to suit vested political interests? If so, the people of the country should stand united and not let the divisive forces have the last laugh.